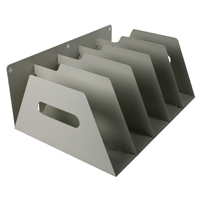 Rigid and durable rack for housing lever arch files, directories, ring binders etc. Manufactured from Grey powder coated steel. Fixed dividing plates have rounded corners. Available in 5 lever arch capacities.